Seth Rich was conscious and breathing when police arrived to the scene. A new video has surfaced of a man named “Mark Mueller”, who could be going by the alias “Scott Roberts”. Scott Roberts claimed to be Seth Rich’s neighbor…a neighbor who also identified Seth Rich moments after he was shot. Mueller says police walked Seth Rich past him after he was shot to identify him and said that Rich ‘didn’t even know he was shot’. He tried to comfort others at the vigil saying Seth Rich didn’t feel physical pain. 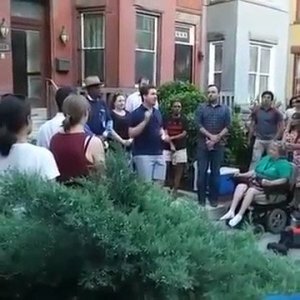 A vigil was held for slain DNC staffer, Seth Rich where Debbie Wasserman Schultz was also in attendance. An eyewitness came forward saying, “I was there when he (Seth Rich) got shot and they walked him past me so that I could see him and identify him because I knew him in the neighborhood, and the police officer said, ‘he didn’t even know he was shot’. Seth Rich was conscious and breathing when police arrived to the scene. As TGP previously reported, according to Public Incident Report CCN #16113797 dated July 10, 2016 by the Washington D.C. Metropolitan Police Department, former DNC employee and the leaker of emails to WikiLeaks, Seth Rich was alive when the police found him on that date. He died later that morning. The report also notes that Rich was conscious and breathing with gunshot wounds to his back when the police found him. The report also notes that at least three of the police at the scene wore body cameras that night. Full video of vigil. Listen to the man @at the 6:28 minute mark.